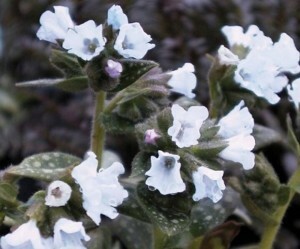 A good compact cultivar, clusters of wide open pale-blue flowers, above small dark green leaves that are variously blotched and spotted silver. Good for shade and semi shade, front of border plant will flower from late February, March and into April. You can also use in containers for early interest and the spotted foliage will provide ongoing interest until the next winter. Likes rich fertile soil that does not dry out. March is well here now, and officially spring has started, its started very windy and wet, with storm force winds and then some frost at night, some of us have even had snow. I see many plants starting to shoot, front of my house Roses are budding up and producing leaves, Geraniums are just starting to appear. One early flowering group of plants that will be coming into bud and flower now are the Pulmonarias. There are quite a few different forms of Pulmonaria with varying degrees of silver spotting on leaves, some are almost completely silver or grey in colour. So they are ideal subjects for a plant breeding project, plant a group of different varieties together, with different flower colours and foliage, from the seed collected you may get some interesting hybrids. Of course you can actually make some crossings yourself, keeping notes and photos of your plant breeding. Pulmonaria Opal is such a plant that was selected out and protected, the name OCUPOL is the protected name, it has a USA Plant Patent. When the UK leaves the European Union then for Plant Breeders Rights most likely we will need to protect plants in UK and also EU, I can prepare documentation for either territory and for the EU you will need a procedural representative, I have a contact in the Netherlands who can assist me with that, so I’m able to offer UK Plant Breeders and ongoing services for trials and Plant Protection in the UK and also the EU. Its a good time to visit the first plant fairs of the season looking for new, unusual and interesting plants, can also find items that you can use for plant breeding. They are also good for plants generally items that you will not find at the larger garden centre. Well it looks like its come in like a lion, with strong winds most days although we have had some night frosts. Don’t prune spring flowering shrubs yet wait until flowering is finished other wise you will lose flowers. Deciduous climbers will be budding up and starting into growth, so you can prune out dead stems and generally tidy up. You can still scarify where needed, good to get the moss and other debris out of the thatch of the lawn. Herbicides can be applied to get control of perennial weeds. Clean any waterfalls any gulley’s or streams. Remove any leaves and other debris that has collected over the winter. Carry out repairs to fencing, paint and treat where needed. Take time to walk round garden each day, as plants will be starting into growth and new things will be appearing every few days. Good time to look at the garden furniture and clean where needed. Get out the patio heaters and chimineas you might be able to sit out on some days, I know locally we have had a weekend where temperatures were above 20°c and in the evening you can light up the chiminea and dream of the longer days to come. British Summer time starts on Sunday 31st 01.00AM. – Hurray!